Bed Bugs – Jones Pest Control Inc. Bed bugs are not a housekeeping or a sanitation issue. They are, however, a big problem for both homes and businesses here in North Carolina. They’re making headlines in newspapers, magazines, TV, and radio. Outbreaks can happen anywhere from big cities to small towns. For North Carolina homeowners, Bed Bugs are unhealthy and can cause skin rashes, psychological effects and allergic symptoms. As you know, bed bugs have become a major concern Perhaps one of the most sensitive pest issues that property owners contend with, a bed bug infestation can be stressful and time consuming. Bed bugs are hitchhikers and have no boundaries The earlier an infestation is detected the easier and quicker it can be eliminated. In the event these unwelcome guests have decided to spend the night, treatment options are available. 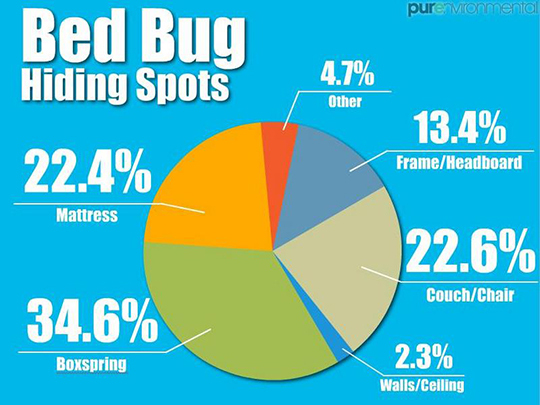 We also offer mattress and box spring encasements to aid in bed bug control efforts, so you can rest easy. Heat Systems are by far the best way to get rid of Bed Bugs.. Bed Bugs have been developing a resistance to commonly used pesticides, but heat has the ability to kill them quicker. First we start off with safe heat distribution of up to about 125° F. Bed Bugs are attracted to this heat and are killed by it. Our Technicians will monitor the heat to ensure it is safe and is reaching all locations of your home or business by moving the air around. We do a post inspection to ensure there are no remaining Bed Bugs. A average size house around 1,500 sq. feet house will take up to two to four hours to complete. Here at Jones Pest Control Inc. we use the most modern application of insecticides and/or steam will be used to treat cracks and crevices in the treatment area. We’ll use HEPA-Vacuums for vacuuming mattresses, baseboards and carpets, sofa/couches, etc. This service includes the initial treatment, and two follow-up treatments to be evenly spaced 7 days apart after the initial service. At Jones Pest Control Inc., our goal is to protect the health and safety of our clients in Eastern North Carolina, including Jacksonville, Greenville, Wilmington, Fayetteville, Raleigh, Swansboro, and Camp Lejeune. If bed bugs are threatening your family or your employees and business, contact us today.